You know this thing about Sunny Day Games? Sunny Day Games is a new category appeared in exclusivity on our site, cute-games.com, a category with a lot of challenges for kids, both girls and boys. I am sure you will have fun here with your heroes from the new Nickelodeon animated television series, Sunny Day. In Sunny Day Games you can find 2 games that we've published for these kids and childrens that are interested to play Sunny Day Games, this game gategory have been created on 01.09.2017. These games with Sunny Day Games have been voted 1 times and the avarage of vote is 5.00 stars. We advice you to play the last flash game from Sunny Day Games, Smiling and Styling with Sunny that have been published on 23.09.2017 16:00. Smiling and Styling with Sunny its a part of Sunny Day Games category and until now its played 1025 times. Try it now on Cute-Games.com! If your like the Smiling and Styling with Sunny game you can write a comment in the game page. Recommend this game to your friends if you like it! Sunny Day Coloring Book its a part of Sunny Day Games category and until now its played 857 times. Try it now on Cute-Games.com! If your like the Sunny Day Coloring Book game you can write a comment in the game page. Recommend this game to your friends if you like it! Find More About Sunny Day Games! 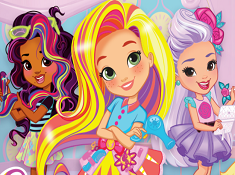 I am going to present you a few things about this amazing new show from Nickelodeon called Sunny Day and then I will present you some games from this new exciting category appeared in exclusivity on our site, the best games site in the country. So, this new animated television series, Sunny Day, is about a cute girl named Sunny who is a hairstylist. She lives in Friendly Falls. I will bring you all kind of interesting games here on our site so stay tuned and check us every day. We are going to bring you ten new games daily and weekly new categories like this one, the Sunny Day Games category full of challenges for girls and boys. In the show, the girl, Sunny, is going to have all kind of adventures and funny moments with her friends, not only at her salon but also in the city. She is going to use her skills and talent to solve all kind of problems, to help other people. She is very smart and she loves what she is doing at the salon. She is very happy when she sees that the customers are happy after she takes care of their hairstyles. In the salon there are a lot of people who help Sunny, for example her dog, Doodle. He is a talking dog and he is going to help Sunny with all kind of things. Also he is very funny and he makes everybody laugh in the salon. Rox is the one who dies the hair for the customers. She has colored hair and she loves making people smile. Blair is the receptionist at the hotel and she is going to take all the appointments. she is very organized and Sunny is very happy to have her. Timmy is a strange friend of Sunny who likes organizing beauty contests in the city. He is secretly in love with Sunny so he tries to be near her all the time. Cindy is the baker of the city and she has always bad luck. She is always at the salon making a new hairstyle because she messes her hair all the time. Scratch is the dog catcher from the town and he is a villain because he tries to catch all the dogs no matter if they are lost or they are bad. Lacey is the one who always tries to win the contests that are organized by Timmy. She will do everything to win the contest even lying and cheating. 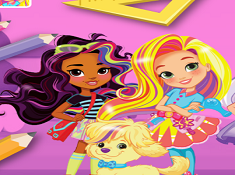 We are happy to tell you that now on our site you have games with Sunny and her friends. The first game from the Sunny Day Games category is a coloring game. This is a special one because here you will color a whole book with images with Sunny and her friends, not just an image or two. I am sure you will be glad to see a lot of images with Sunny here on our site and you can even save them after you color them. The most important thing in this game is to focus. You have to pay attention to the details, to chose the right colors for each part from the game. You need the mouse to complete your tasks step by step in this creativity game from Sunny Day Games category. You can express your opinion about Sunny Day Games category in a comment. There you can tell us also which is your favorite character, what other categories you want here on our site and so on many other things. Give us a like if you want to show us that you appreciate our efforts. Sunny is always in a good moon and she likes making other people smile too. She is always confident and persistent so you can learn a lot from her. In this game you are going to get all kind of challenges for girls and boys. Do not give up no matter what challenges you face because with training I am sure you can overtake them and you will complete your goal successfully. A good score in these games can help you reach the top of the best players in the world.